I already blogged Paul Brown's Drools book release here. Now I hear there is another Drools book on the way by Michal Bali, also in Ireland. What's great about this is it adds another level of consideration to enterprises considering adopting rule engine technology. With any software choice there are risks that need to be assessed. Things like how easy is it to hire people skilled in those technologies or find consultancies that offer services for those technologies. The more prevalent the software the lower the risk of those issues. Books are a good tide mark of how prevalent a technology is. With not one but two Drools books on the way, I think it's safe to say that Drools has gone a long way to reducing the perceived risk of it's adoption compared to other "major" vendors who don't warrant enough market share for a publisher to publish a book. Business rules can help your business by providing a level of agility and flexibility. As a developer, you will be largely responsible for implementing these business rules effectively, but implementing them systematically can often be difficult due to their complexity. 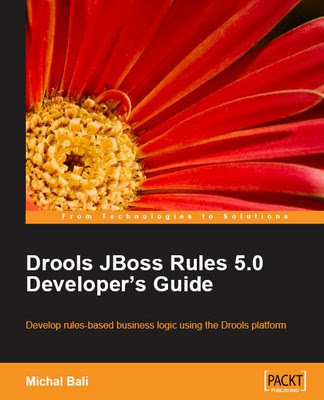 Drools, or JBoss Rules, makes the process of implementing these rules quicker and handles the complexity, making your life a lot easier! This book guides you through all of the features of Drools, such as dynamic rules, the event model, and Rete implementation with high performance indexing. It will help you to set up the JBoss Rules platform and start creating your own business. It's easy to start developing with Drools if you follow its real-world examples that are intended to make your life easier. Starting with an introduction to the basic syntax that is essential for writing rules, the book will guide you through validation and human-readable rules that define, maintain, and support your business agility. As a developer, you will be expected to represent policies, procedures and. constraints regarding how an enterprise conducts its business; this book makes it easier by showing you it can be done. A real-life example of a banking domain allows you to see how the internal workings of the rules engine operate. A loan approval process example shows the use of the Drools Flow module. Parts of a banking fraud detection system are implemented with Drools Fusion module, which is the Complex Event Processing part of Drools. This in turn, will help developers to work on preventing fraudulent users from accessing systems in an illegal way. Finally, more technical details are shown on the inner workings of Drools, the implementation of the ReteOO algorithm, indexing, node sharing, and partitioning.